Electricity & Gas For Business - SSE Airtricity Northern Ireland. As well as supplying greener energy to more businesses than any other supplier in Northern Ireland, we’re also proud to be the largest generator of wind power in the all-island Single Electricity Market, with 26 wind farms generating 580MW of renewable electricity. We can’t let a resource like wind pass us by, we have to capture it. We have to do it in a way that works with the community, that creates jobs and that’s respectful to the environment and the people who live here. 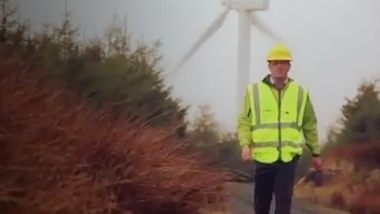 SSE Airtricity is powered by SSE with energy from the largest wind generation portfolio on the island of Ireland. In addition to the renewable energy offtake from SSE plc’s fleet of wind farms, SSE Airtricity has Power Purchase Agreements (PPAs) with other generators for over 300MW of wind and solar power, including 46MW from the largest solar farm on the island – Bann Road at Rasharkin, Co Antrim. SSE Airtricity is proud to be the leading provider of natural gas in Northern Ireland. We supply natural gas to home and business customers in the Greater Belfast area, ‘Ten Towns’ network, and from April 2017 onwards, the new ‘Gas to the West’ network. SSE Airtricity is a trading name of SSE Airtricity Energy Supply (NI) Limited which is a member of the SSE Group. The Registered Office of SSE Airtricity Energy Supply (NI) Limited is 3rd Floor Millennium House 19-25 Great Victoria Street Belfast Northern Ireland BT2 7AQ Registered in Northern Ireland No. NI041956. Complete all of the details below, and one of our Business Energy Team will give you a call with a quote for the plan which best suits you. Alternatively you can give us a call on 0345 850 8940^.